. Index of Persons in the Darumapedia . As the head of the Nagao family, Kagetora turned to the difficult business of cementing his control over Echigo, a time-consuming process given that Echigo was noted for the fiercely-independent nature of it’s people. ... the capital and all the land around it was controlled by Oda Nobunaga, the rising ‘super-daimyô’ who had been the one to install Ashikaga Yoshiaki into the shogunate in 1568. Afterwards, Nobunaga had courted Kenshin’s favor with a series of gifts and letters that resulted in a pact against Takeda Shingen. Among the gifts Nobunaga sent to Kenshin were a pair of screens depicting life in Kyoto, known as the Rakuchû rakugai zu　洛中洛外図, which would later assist historians in gathering a sense of life in the capital at the time. ... Uesugi Kenshin was one of the most reknowned warlords of the 16th Century, a colorful figure who combined a love of campaigning with a thirst for learning and a genuine sense of honor. A devout religious man, Kenshin would never marry nor produce off-spring. 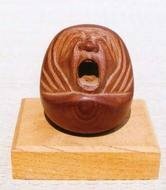 Buddhist vows did not, however, prevent him from acquiring a taste for drink, which he consumed in copious amounts during his lifetime and may well have contributed to his early demise. Read his bigoraphy HERE ! 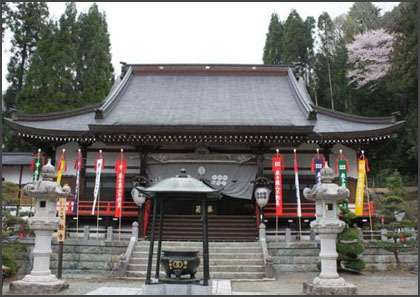 Gyoki built a small hall for a statue of 大日如来 Dainichi Nyorai, which he carved himself. 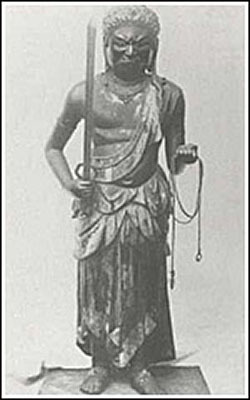 In 1559, Uesugi Kenshin received a statue of Fudo Myo-O from the regent in Kyoto to use it in unifying the Kanto region. 権現瀧 Gongen Waterfall (75 m). 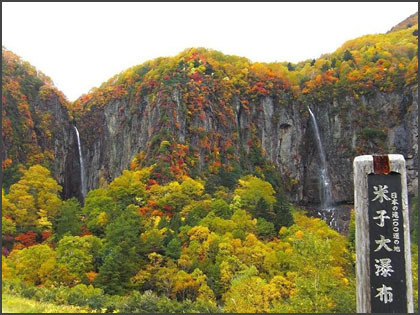 These two large waterfalls are among the 100 best of Japan. 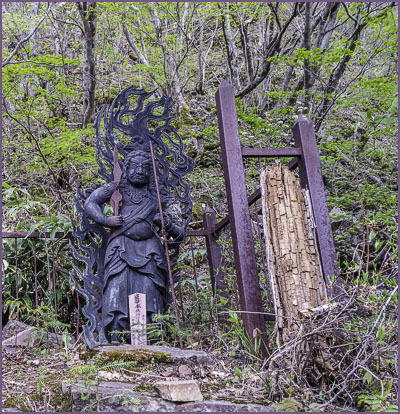 Statue of Fudo Myo-O near the waterfall. Follower of the son of Kenshin.